Home » Resources » Blockchain | What is blockchain technology? I’m sure you’ve heard of the term previously. I guess in the news about the most popular cryptocurrency a.k.a. bitcoin. Because blockchain, originally block chain, is the disruptive technology behind digital currencies. But do you know what is blockchain? Here’s blockchain explained, just for you. According to Wikipedia, a blockchain is a continuously growing list of records, called blocks, which are linked and secured using cryptography. […] For use as a distributed ledger a blockchain is typically managed by a peer-to-peer network collectively adhering to a protocol for validating new blocks. Once recorded, the data in any given block cannot be altered retroactively without the alteration of all subsequent blocks and a collusion of the network majority. The person (or group of person for all we know) behind block chain is Satoshi Nakamoto. While he/she/they defined the concept in 2008, he/she/they implemented it as a feature of bitcoin the year after. And many alternative cryptocurrencies have their own block chain. While Nakamoto implemented it as the ledger of bitcoin, you can find the technology in many different domains. Indeed, blockchain technology has the potential to transform the way we do business in the long term. 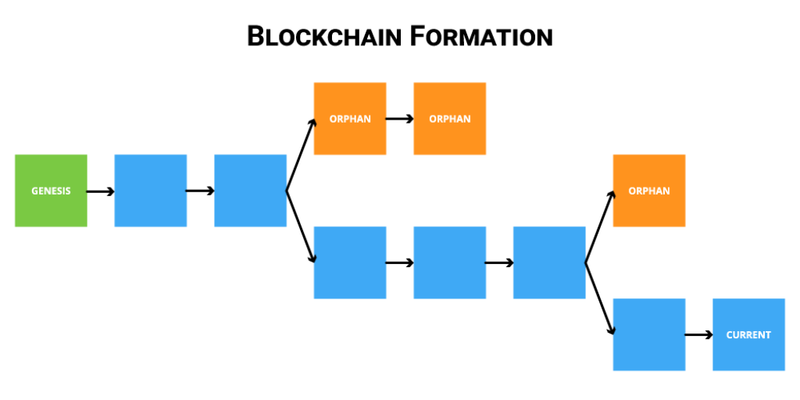 What is a block in block chain? The content where you can find the transactions, their amounts and the addresses of payer and payees. Given the current block, you can access all the previous blocks linked together in the chain. So the database retains the complete history since the origin block. Now that you know what a block is, let’s see where you can find these blocks. As I said above, they’re on all the nodes of the network. So what’s a node? It’s a computer of the blockchain network that verifies and relays transactions. And most nodes don’t do it for free. Indeed, there’s a reward (like bitcoins) for the node solving the cryptographic problem of a block. So the nodes are actually competing to get the rewards! Microsoft Word is following the classical way of collaborating. Because only one person at the time can work on a single document. So if a colleague is working on it, you have to wait until he saves it to make further changes. While Google Docs is implementing the principles similar to the block chain technology. Both you and your colleague have access to the document at the same time. And you can work on it together, the changes you make sync on a single version. It’s an oversimplified explanation, of course. But I think it’s quite powerful to know how blockchain works. And I’m sure you can get it now. By design, this technology has built-in robustness. Indeed, not one single entity can control a block chain. Because the database is identical across its network. Also, there’s no single point of failure. Should a node disappear, the process would keep on going unaffected. Furthermore, all the participants can access the complete history of transactions. There’s total transparency. Therefore anyone can verify and audit the block chain data. Finally, the more nodes in the network, the harder it becomes to overcome the verification activities of the majority. So the network keeps getting more secure with time.